I remember wanting a crystal ball six or seven years ago but not knowing how to use it, or even if it would work, whatever that means. I was clueless but nevertheless intrigued by these spheres that sparkled in the sunlight. In movies, we see gipsies with quartz balls while they do tarot readings, and they are meant to amplify our intuition, whether we use them for scrying (scrying is when we gaze into a crystal ball, a mirror or a bowl of water and begin to see images) or just let them sit on the shelf. Every now and then I sit down to meditate with my quartz sphere and while it is pretty cool because your intuition is enhanced, this isn't how I usually use it. Quartz spheres are my go-to crystals for intention setting. Often I will set one on my nightstand in front of an image, a picture that reminds me of something that I want to create, attract or better yet, amplify. The idea is for the quartz crystal to amplify that quality in my life, whatever it is. 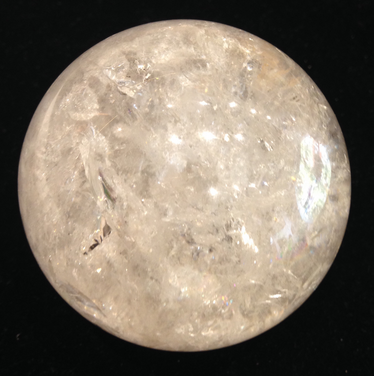 For example, right now I have a nature scene on the table behind my quartz sphere, it reminds me of peace, stability and healing. We can work with clear quartz in this way because its molecular structures amplifies whatever intention or energy we program it with, and spheres radiate that energy in all directions. We can give a specific intention more power by lighting a candle and meditating on the image whilst holding the sphere in our hands and filling it with light. The key is to focus on the feeling behind the visualisation - and to ask the universe to bring that feeling into your physical reality (while also asking your intuition to guide you in taking the right steps to make it happen). This is actually quite easy when we learn to ask for our Heart's Desires and not the Ego's. Last year I gave a reading where Manifesting kept coming up; specifically, how easy it had been for the client's family to score last minute tickets and freebies to see some of their favorite bands. When it came to other "wants" like a business venture, or a new car, the process was slower. The message that day was about the bliss we feel when we are at a concert and how it is not a stepping stone to anything else - you just want to enjoy the moment. If we want to manifest other qualities with that same level ease in our lives, we have to connect with the end goal (or the end feeling) and not an item that we think will fill that gap. If your crystal is new, you will need to clear it first - although I would recommend clearing and charging it anyway to focus all its energy on this new intention. - Begin by grounding yourself, you can do this by visualising tree roots growing out of the bottoms of your feet into the earth. Surround yourself with diving light, and then use all of your Heart and Soul to focus on something that you would like to create in your life. To do this effectively you have to focus on the feeling that you would experience in a given situation, instead of the thing that you want to ask for. - Hold the quartz sphere in your hand, and visualise a stream of clear light flowing down from above, into your Crown Chakra, down through your Brow, Throat and all the way down to your Heart. Feel your intention in your Heart, and as it begins to overflow that energy and those visuals travel down your arms to your hands into the crystal ball, where it is amplified so that the feeling fills all your cells. - Visualise that clear light coming down from above, and see it changing color to a green, pink or gold. It takes shape inside the crystal and comes to life in your mind's eye. Put the crystal ball back on the shelf and intend for it to continue radiating that energy out, in alignment with the highest good. When that situation comes to pass, you can thank the crystal, clear it and fill it with light again - following the steps in this Crystal Care post. It is also worth mentioning that our fears and beliefs can block certain things from coming to fruition, and this is where self-healing comes into play. There are different ways to go about it. Byron Katie's The Work has proved to be really useful for me. If you have my Chakra Healing & Magick book, I would also suggest looking at the section on Affirmations in Chapter 3, as it approaches the verbal and emotional sides to stating our intention and putting our energy into it. If you have crystals of your own that you'd like to work with, be sure to clear and charge them first, especially if they weren't cleared when you first acquired them. Read this post on Crystal Care 101, or turn to Chapter 7 in my Chakra Healing & Magick book for more on healing.